The Department of Philosophy & Religion offers majors and minors in both philosophy and religious studies. 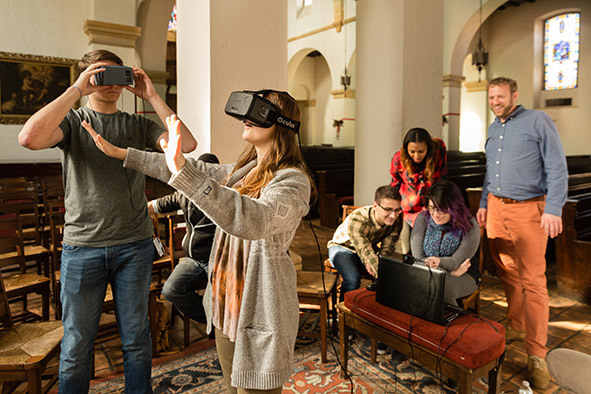 Religion students in Todd French’s God, Robots, Technologies of the Self course consider the juxtaposition of Knowles Memorial Chapel with sacred virtual spaces using virtual reality headsets. Philosophy students at Rollins explore the ideas of great thinkers from Plato and Aristotle to Kant and Nietzsche. Thematic courses range from ethics and social philosophy to the mind-body problem. Religious Studies students at Rollins explore the world's faith traditions and the role of religion in culture. Topics courses range from "Cults in America" to "Women in Judaism and Islam."